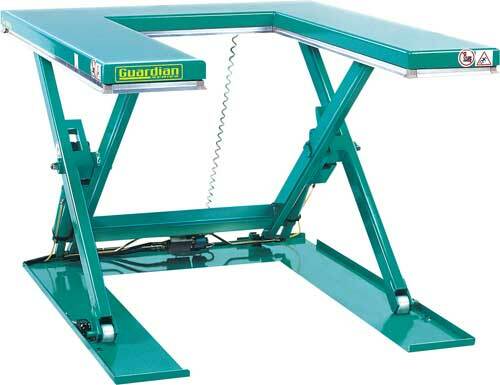 The "U" Low Profile Tables have all the safety features of Lift Products Low Profile Guardian Series Lift Tables. The low profile feature provides greater flexibility since a variety of applications can be accommodated. Also, installation costs are reduced since the need for a floor pit is eliminated. Load and unload pallets onto the Guardian U-Lift without the need for a loading ramp. The floor mount power unit has the pump motor and tank on the plate frame. This is ideal for placing the power unit under a conveyor or work bench or when locations are required. Features 8' hoses, power cord and control cord. Three-button control box has 115 voltage single phase standard on 1,100 lb. and 2,200 lb. capacity units. 230/460 voltage three phase on 3,300 lb. units. External power unit equipped with a relief valve against overloading and a compensated flow valve for controlling lowering speed. Supplied with 8 ft. long hoses. 115 voltage single phase standard on 2,200 lb capacity units. 230/460 volt 3 phase standard on 3,300 lb units. Self-lubricating bushings on pivot points.